Combine white wine, sugar, zest, bay leaf and vanilla bean in a large saucepan over high heat. Bring to a boil then simmer for 10 minutes. If using fresh fruit, while syrup is simmering cut fruit in half and remove stems and cores. Add fresh fruit to syrup and cook until tender, about 10-15 minutes. Add dried fruit to the pot and simmer until fruit is plump. While fruit is poaching, heat a small fry pan over medium heat. Add a touch of olive oil and fry nuts and seeds of choice. Season with a little sea salt. 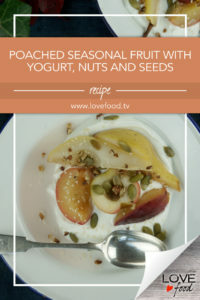 Spoon yogurt into a bowl. 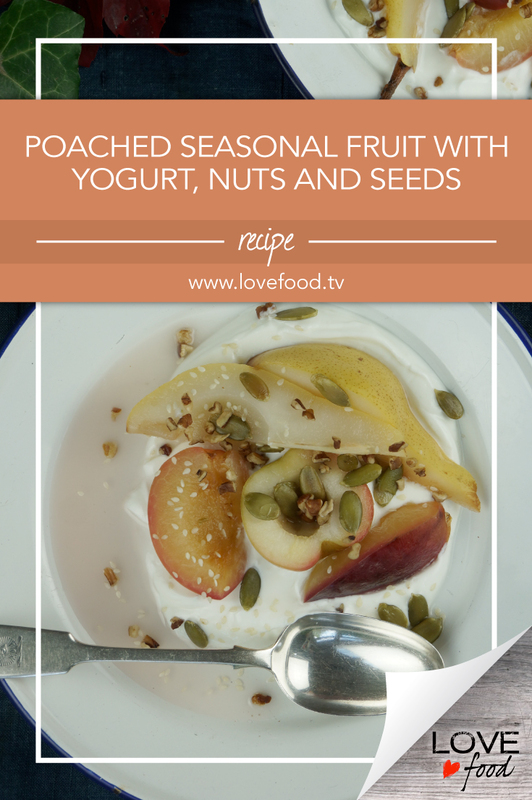 Top with fruit, poaching liquid and a sprinkling of nuts and seeds.